"Einstein once said that perhaps one of the deepest emotions we can experience is the appreciation of the mysterious. And in order to engage the mysterious, we have to take risks. We have to stick our necks out and make theories that may ultimately be wrong." What did you want to be when you grew up? When did you know, and did you get there? Michael Apted does something delightful here: he focuses on what makes scientists tick. Featuring seven leaders in their respective fields, he allows their personalities and processes to unfold in four parts, giving us a brief peek into the creative mystique. Where other filmmakers might highlight their achievements, Apted is after something else: he encourages his subjects to claim their accomplishments and move on to how they got there�not specifically, but abstractly. How best to discuss the geneses of genius?Apted explores the inspirational basis of these exceptional careers, from childhood stimuli through exploration and ultimate success. Although he does not unlock any secret "how-tos"�there aren't any�he does manage to bring out how these particular people shaped their own lives to reach their goals. Michio Kaku, a theoretical physicist, loved science fiction as a child, admired what he saw as the "force of intellect" and wanted to complete Einstein's unfinished dream; Patricia Wright, now a primatologist/conservationist, enjoyed Gerald Durrell's animal stories and books about expeditions to rain forests. While revelations like these are not surprising, they do attest to the idea that our earliest instincts might be our best, and that a child's interests and enthusiasms ought not be ignored. "Science, for me, is almost a religion. To me, science is truth, and truth is beautiful." �Gertrude ElionGertrude Elion, who died at 81 shortly after this filming, began, like so many, wanting to cure cancer in her lifetime. While she did not exactly succeed, this pharmaceutical chemist shared a Nobel Prize for her research that brought the survival rate of children with leukemia from under 20% to 80%. Not bad for a woman relegated, early on, to testing pickle brine. Other scientists included are Maja Mataric, a computer scientist devoted to artificial intelligence and robotics; Karol Sikora, a professor of cancer medicine; Ashok Gadgil, an environmental physicist; and Steven Pinker, a cognitive scientist. Each one seems to have understood at a young age exactly who they were and what they were meant to do. Perhaps the best legacy of these people is their ability to infuse others with curiosity and wonder: for the first time in my life, I wish I'd been better at algebra. That's BIG.Michael Apted is a pretty fascinating guy himself. A versatile filmmaker, his work includes such diverse features as Gorky Park, Gorillas in the Mist and The World is Not Enough, as well as documentaries like this one and its predecessor, Inspirations, a similar piece about artists, the right-brained counterparts of those featured here. One of his most interesting projects is a series beginning with Seven Up, in which he documents a group of children in his native Britain at age seven and continues to revisit them every seven years (currently at 42: Forty Two Up). "Science will play a central role if we actually go ahead and save ourselves from disaster. I'm fascinated, delighted and a little bit scared that we live in these times, because it's going to be a major decision point, in either letting things got to hell or trying to see if, and how, we can salvage it." -Ashok GadgilAfter the section I found most intriguing�both encouraging and chilling thoughts about ethics�the director wraps up his film with a discussion about the future. The enthusiasm these scientists have for their work and the peace they seem to experience, believing that they have contributed well and that their work will be built upon for generations, seems a splendid one indeed. The title, Me & Isaac Newton, comes from a quote by Kaku as he spins and glides on his ice-skates, a thing he does to clear his mind. The sight of this grown man, a respected theorist, participating in this graceful activity seems so simple: free your mind and anything is possible. He made me believe. Image Transfer Review: The image is crisp and quite even overall. Shot in a variety of locations, the assemblage is seamless and makes a pleasant viewing experience. The source is clean and the transfer shows no digital artifacts. It does its job perfectly. Audio Transfer Review: The audio is about all one expects from a recent documentary: the speakers are clearly understood (save Gadgil's accent at times), and the levels are steady. Extras Review: Besides the inclusion of a brief but informative single-fold booklet, there is only an absolutely basic menu that offers a choice to play the movie and one that goes to the ample chapter selections. However, for this documentary about brilliant minds, we fittingly had some at work on the menu design. Nothing wild, but it scrolls vertically... pretty cool. Now, if only the music looped as interestingly; its about as annoying as audio enhancements come. Don't miss the design, but hit mute first, especially on the second and third screens in the chapters area if you plan to spend more than 10 seconds there. Unfortunately, the grade gained for the unusual visual is lost to the nerve-rippling sound. "Science is a tool to understanding how everything works, so we don't destroy it." 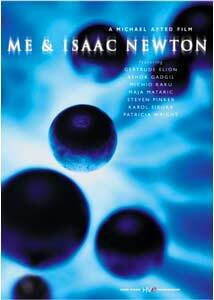 �Patricia WrightThe "Me" in Me & Isaac Newton could be you, could be any one of us. This terrifically watchable documentary from Home Vision is one you'll want to keep around for inspiration. If not for yourself, pop it in when your kids come to you with a curiosity, more than once, on the same subject.